We are now pushing into the home stretch here in NJ. June and July brought us some of the best Yellowfin Fishing in 8 years. No doubt about it. The first couple weeks of August have seen things slow down dramatically, but over the last several days, we are beginning to see the signs of things picking up back in the Canyons, as they should this time of year. The majority of our fishing for the last month has been in 20-30 fathoms, inside the canyons. We expect this to change beginning with next week. The White Marlin bite has turned on quite nicely, and Yellowfin are once again being trolled up offshore. This has been the best year for Big Eyes, that I can personally remember. Just last week, we had 11 on at one time! The great inshore chunking action we had in July will likely move offshore as the overnight bite begins later this month. Also, we have been getting swordfish bites regularly now, after having almost none in June and July. Swordfish and Mako action should continue to improve over the next few weeks. Trips: We are still doing 12, 14, 16, and 22 hour trips as well as an occasional 46 hour trip when the weather allows. The majority of our trips the rest of the year will be 22 hour overnights. As conditions allow, we will do shorter inshore trips (12 hours) as well as longer 16 hour day troll trips to the canyon, but the main trip is the 22 hr which allows us to target Tuna, Marlin, Mahi, Swords, and Sharks all in one trip.. Dates: The end of the season is in sight! If you are going to get out, now's the time to schedule. We are booking dates between now and the end of September. October will again be used to make up trips cancelled in September and for last minute trips, weather permitting. The moon is dark on September 16th next month. We expect the best fishing to take place by the third week of September. Boats: Fishing offshore, we have both our 55' Custom Carolina Boat (LOW PROFILE) and our 48' Sportfish (JUSTIFIED), both setup specifically for NJ canyon fishing. JUSTIFIED is in New Jersey year round and this season, LOW PROFILE will be available from mid July till October, then will head back to Hatteras, NC for the rest of the Fall. The majority of our Open Boat Trips will be on Justified. For more information on our New Jersey fishing charters check out our New Jersey web page and feel free to give Trey a call directly at (305) 619-0235. Or call toll free at 1-866-682-8862. 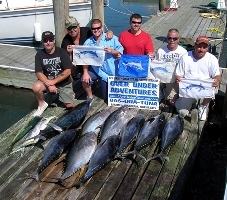 We also offer single spot bookings for Tuna trips throughout the season. A complete scheduled is kept up to date on our web-site. Rates for single spots are $400 for 12 hour offshore tuna trips and $600 for overnight trips. Please check out our Open Boat Page for all our open dates or to get on our Open Boat email list. If you have 3 or more people and don't see a date that works, let us know and we'll look at scheduling a new date for you.